Sometime ago Hannah asked if her grandfather fought in the war (the Second World War). Good question I thought and I got the box with all the family photos and other stuff out of the attic. In there was also the notebook / diary of my Dad (Arie Koorneef, 1925 - †2003). 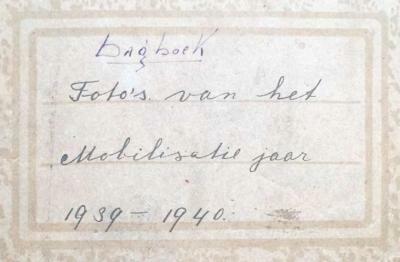 In the first pages photos from newspapers are pasted from the Dutch Army mobilisation period 1939 - 1940. I'd never before tried to read the handwritten diary which starts on the 17th of September 1944: the start of Operation Market Garden. After reading it I typed the diary in a Word file, see the attachments below. The scans of the diary are also included. Some parts of the diary were told by my dad to me but I didn't know everything.